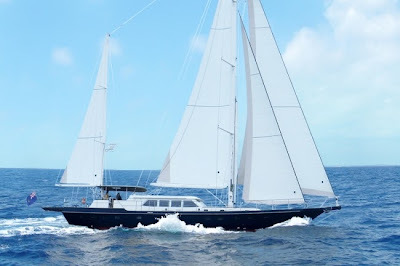 DOMICIL 85 ft launched in February 2013, custom built in Holland with the highest standards of engineering and craftsmanship. This yacht is based in Curacao and promoting a new cruising area (out of the hurricane belt!) with plenty to offer guests in superb diving and snorkeling, steady winds for sailing and a mixed culture. The crew is well versed with years of experience in the Hospitality Industry and would love to show your clients the Dutch Caribbean! Her introductory rate is: $19,500. USD /4 $17,500. USD/2 This includes food, standard bar. DOMICIL’s entire 85 foot length and 15 foot beam is dedicated to the pampering of just four guests. She was launched at Holland’s SRF Shipyard in February 2013, built to the highest standards of engineering and craftsmanship. Hans Robben, the skipper, drew on his career as the owner of five star hotels and resorts on Curacao to design the voluminous interior space for total luxury. The skillful blend of contemporary and Asian art compliments leather chairs and upholstered banquettes, creating a relaxing atmosphere. The deck saloon, lower saloon and aft deck offer beautifully appointed dining choices for savoring the outstanding cuisine prepared by your private chef. Two spacious state rooms welcome four guests. The queen-bedded aft suite features an upholstered sofa in the sitting area. The forward stateroom has large twin beds. Both state rooms have en suite baths with marble vanities. DOMICIL is fully air-conditioned. DOMICIL accommodates 4 guests in 2 cabins. The Master cabin is aft with a queen size bed, bathroom with marble vanity counter, stall shower and toilet. The forward Guest cabin has 2 single beds, a sofa and en suite bathroom with a stall shower and toilet. The interior's neutral colors and warm wood tones compliment many modernist paintings and oriental objets d'art, creating a serene atmosphere.